Sun Mountain Lodge is an award winning Four Diamond Resort in Washington State. We have achieved international acclaim with awards for the hotel, guestrooms, cuisine and wine list. As a destination resort our guests can relax and remove themselves from daily routines as well as opt for our long list of activities. Our Team at Sun Mountain Lodge will make your visit a peak experience. Sun Mountain is closed for two short periods during the year. The dates do vary but usually from the end of October to the middle of December and then close again in the middle of March to the middle of April. Sun Mountain Lodge resides in North Central Washington State on 3000 acres. 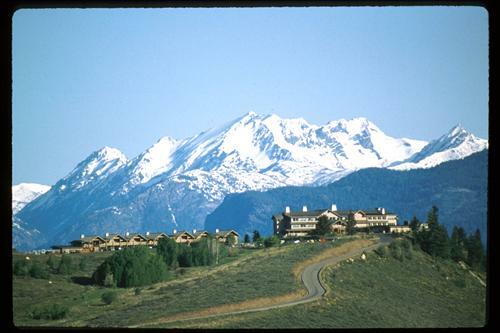 We are a destination resort at 2900 feet in elevation with views of the Cascade Mountains and Methow Valley below. We have four separate seasons. Spring, Summer and Fall are wonderful for enjoying biking, hiking, swimming, canoeing, tennis, fishing, golf and river rafting nearby or just relaxing. Winter we have the largest cross-country ski trail system in North America. Another winter choice would be snowshoeing or having a sleigh rides.